The New Jersey Devils' recent lack of offensive production may wind up costing them the top spot in the Eastern Conference. The Minnesota Wild's similar problem may keep them out of the playoffs. A pair of teams looking to turn around their struggling offenses meet Thursday when New Jersey makes its first trip in more than five years to Minnesota, which is hoping to avoid a fifth straight loss. The Devils (40-24-6) have scored only 10 goals in their last seven games, going 2-for-23 on the power play. 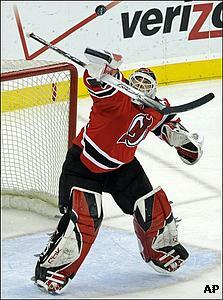 However, thanks to some outstanding goaltending from Martin Brodeur, they've managed to go 3-3-1 in that stretch. Brodeur has a 1.78 goals-against average in the last five games, dropping his conference-leading season average to 2.14. The Devils were leading the East standings heading into Tuesday's game at Montreal, but lost 4-0 to allow the Canadiens to overtake them for the top spot. New Jersey also remains in a tight battle with the Pittsburgh Penguins and the New York Rangers for first place in the Atlantic Division. The one player the Devils have been able to rely on for consistent scoring has been Zach Parise, who leads New Jersey with 30 goals and 60 points. The third-year forward had five of the team's eight goals during its three-game winning streak from March 4-8. Parise, a Minnesota native who will be playing his first NHL game in his home state, is a lot more concerned about piling up victories than his own statistics. "The most important thing is winning, and that's the way it's always been here," Parise told the team's official Web site. "That's the most enjoyable part, being on top of the Eastern Conference and winning." The Wild (37-26-7) have picked a bad time to go into a slump. They're 0-2-2 in their last four and have won just three of their last 11 games, scoring only 20 goals. Minnesota would make the playoffs if the season ended Wednesday, but is only three points ahead of ninth-place Nashville in the Western Conference. The Wild have been limited to two goals in five straight games, going 2-for-22 with the power play. Their fourth consecutive loss came against San Jose on Sunday, when Minnesota's Brian Rolston tied the game with less than 30 seconds to play only to see his team lose 3-2 in a shootout. But considering his club rallied from a 2-0 deficit to force overtime against a Sharks team which had won eight straight coming in, Wild coach Jacques Lemaire was pleased with his team's performance. "I think we'll play as good as this in the next games, all the games that are left," Lemaire said. "So now we will determine if we're good enough to be (in the playoffs). That's how it's going to be." Like Brodeur, Wild goaltender Niklas Backstrom has been excellent recently, keeping his team in games despite a lack of consistent offensive production. Backstrom is 3-1-2 with a 1.94 GAA in his last six starts. Rolston, who began his career with New Jersey, is second on the Wild with 26 goals, and he's been one of the few players who has produced offensively of late. He has two goals and two assists in his last three games. Minnesota leading scorer Marian Gaborik (34 goals, 35 assists) has scored just once in his last 10 games. One of Gaborik's nine career hat tricks came against the Devils, but in the most recent meeting between the teams, he was one of three Minnesota players who failed to score on Brodeur in a shootout as New Jersey won 3-2 on Dec. 3, 2005. The Wild's only victory in eight all-time meetings in this series also marks the Devils' last visit to Minnesota - 3-2 on March 4, 2003.